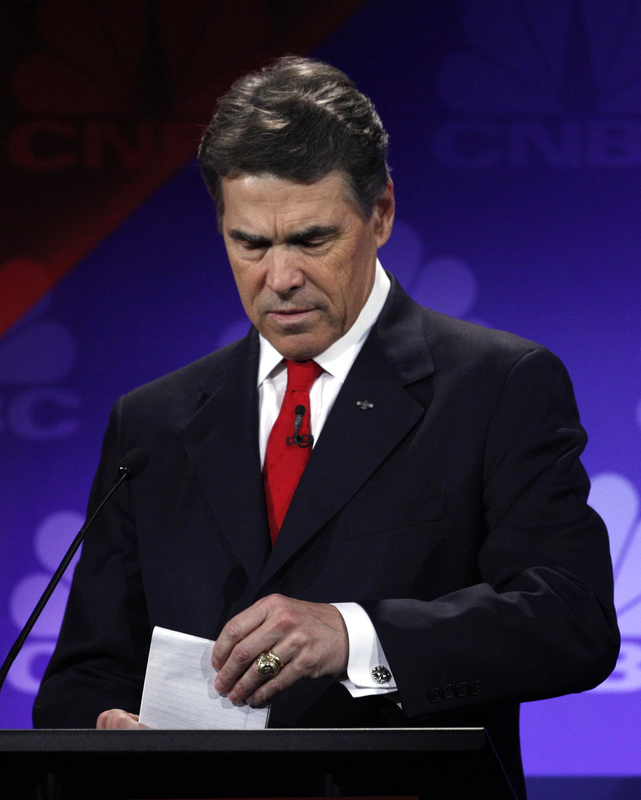 In a cringe-worthy moment during Wednesday's Republican presidential debate, Texas Gov. Rick Perry couldn't remember the third federal agency he has pledged to eliminate. Perry was discussing his jobs plan and his flat tax plan when he said: "And I will tell you, it is three agencies of government when I get there that are gone. Commerce, Education, and the... what's the third one there? Let's see." Perry then paused and there was audible laughter in the room. Texas Rep. Ron Paul then chimed in "You need five," to which Perry responded, "Oh, five, OK. So Commerce, Education, and the..."
Romney then suggested, "EPA?" to which Perry responded, "EPA, there you go, no..." with laughter from the candidate and the audience. Moderator John Harwood from CNBC then asked, "Seriously, is the EPA the one you were talking about?" "No, sir, no, sir. We were talking about the agencies of government -- the EPA needs to be rebuilt. There's no doubt about that," Perry responded. "But you can't name the third one?" Harwood asked. "The third agency of government I would, I would do away with, the Education, the... Commerce and, let's see," Perry said, as his brain freeze continued. However, a few minutes later in the debate, Perry remembered that the third department was the Energy Department. "By the way that was the Department of Energy I was reaching for a while ago," he said with a chuckle when he was asked another question. Following the debate, Perry acknowledged that the moment was "embarrassing," saying that he "stepped in it." "I'm glad I had my boots on tonight because I sure stepped in out there," Perry said in the spin room. "I tell you what - I named two more agencies of government than what the current administration has talked about getting rid of, and Energy just wouldn't come out," he added. "Anyway, those three agencies of government - Education, and Energy and Commerce - are part of it, the bottom line is I may have forgotten Energy, but I haven't forgotten my conservative principles, and that's what this campaign is really going to be about." When asked if he was embarrassed, Perry replied: "I stepped in it, man. Yeah it was embarrassing, of course it was." In an interview with CNBC after the debate, Minnesota Rep. Michele Bachmann sympathized with Perry, saying "we all felt very bad for him." Perry said he would not rethink participating in future debates, as his campaign has in the past suggested he might. The gaffe is likely to reinforce an image of Perry as someone who is often at a loss for words in debates and may not be able to go toe-to-toe with President Obama next fall if he were to win the Republican nomination. Although he was at the top of the polls when he entered the race in August, Perry's standing dropped after a series of poor debate performances in September. More recently, Perry's speaking style was questioned after an an edited video of a speech he made in New Hampshire went viral. Whether this latest blooper will become a seminal moment for Perry's campaign is yet to be known, but it's sure to be played over and over on TV and the Web in the coming days. And that's not what Perry campaign wants as the Texas governor seeks to regain momentum with less than two months to go before the voting begins. Herman Cain's nickname for Pelosi: "Princess Nancy"